Benefits costs are one of the biggest concerns for both employees and executives in every company. For employees, HRSoftware.me is a simple login into your company’s HRSoftware.me cloud web address that will connect them with all the benefits information they will need. The user dashboard displays the benefits they are enrolled in, their plan(s) and the amount they pay vs what the company pays (if you want to show them). It also shows benefits they may be eligible for. They can click to see further details , dependents and history or they can even access the benefit’s provider’s own web site. For executives, monitoring costs is critical as benefits can be one of the largest expenses your company has besides payroll. The problem is, most executives don’t have the time to go stumbling through a benefit company software system to find actual costs. Instead, they rely on preliminary estimates from their benefits company and compare year end accounting reports. Most HR Software systems and even some enterprise HRIS systems don’t collect and display the information needed about a company’s benefits costs. And if they do, it’s not usually broken down by Employee’s costs and the Company’s costs allowing the executive to understand quickly where the company stands. HRSoftware.me allows you to quickly and easily see how much your company’s costs are compared to your employees costs! No longer do you need cringe at the thought of delving into the spreadsheets and working with HR and your vendors to come up those costs. Gone are the days of dealing with the issues of budget oversights and soaring benefits costs at year end just because you didn’t have the real-time information given to you in a simple way to monitor year round. The HRSoftware.me benefits module is located on the Executive Dashboard and quickly outlines your entire Benefits program costs. From Dental, Health, Life Vision 401k plans and anything other benefit you offer. The intuitive interface shows expirations, total enrolled, total monthly costs, Employer and Employee monthly costs allowing you to have complete control with the power of current knowledge to make benefits decisions with! It doesn’t stop there however. If you click “View Details” you can drill into any of the details of any benefit your company offers. 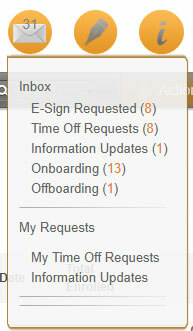 HRSoftware.me has many alert features and an almost unlimited amount of custom alerts that you’re able to create. The dashboard utilizes a simple “Inbox” style “To-Do” alert system at the top that letting each user know exactly what they have to do. Roll over the round alert and it displays the specific categories of items allowing the user to choose the most important to handle first. The E-Mail alert system is designed to allow you to create customized alerts to meet almost every need. For instance, if you want to notify an executive every time a new employee is hired, simply create a “New Hire” email alert in the admin. Alerts can be created to meet new and ever-changing HR laws as well. For instance, create a “Time Off Balance Alert” alerting employees by email to the amount of time off they currently have. These alerts can be custom named, scheduled and recurring, adjusted to meet specific data selections (like time off types), and can be adjusted to be sent to any number of email addresses. The possibilities are almost endless.